Shake it off with “The global Shake Down” every Friday evening from 7pm to 11pm on Vibes Radio – The Champion Station with the one the only Big Ben. 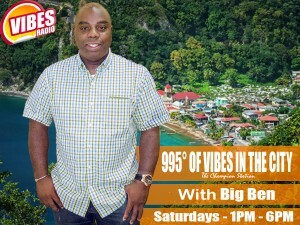 On Saturdays, get ready for “995% of Vibes in the City” with Big Ben. He takes you full throttle on a musical journey that’ll keep you coming back for more. The shows prove the versatility of Vibes Radio because our live stream capabilities has earned us a very large audience on the internet. Big Ben’s name and voice are well known to millions of listeners worldwide, who have become active participants by calling live to the shows.